Yellow gold is the traditional choice for a contemporary groom, and JustMensRings.com has the perfect solution. The 10K yellow gold men’s designer heavy comfort-fit ring exudes sophistication and will pay compliment to your great taste in style. This rich yellow gold band is also surprisingly affordable, so you can stay true to your budget without settling for anything less than the perfect ring. Each wedding band features a comfort-fit design, which is great news for grooms who have large knuckles or work with their hands every day. Best of all, you can customize our 6.5mm 10K yellow gold men's designer heavy comfort-fit ring by adding a special sentiment. Engrave up to 30 characters to encapsulate the first day of your life as a married man. Each 10k yellow gold men's designer heavy comfort-fit ring we offer is designed with a polished finish that gleams brightly in any light. 10K yellow gold contains approximately 41.7% pure gold by weight and an alloy of copper, zinc, silver, tin, and other metals to ensure strength and durability. Due to the comfort-fit design of this elegant yet understated wedding band, we recommend that you or your groom visit a professional jeweler to confirm ring size for accuracy and comfort. Comfort-fit rings tend to measure a half size smaller than traditional rings. 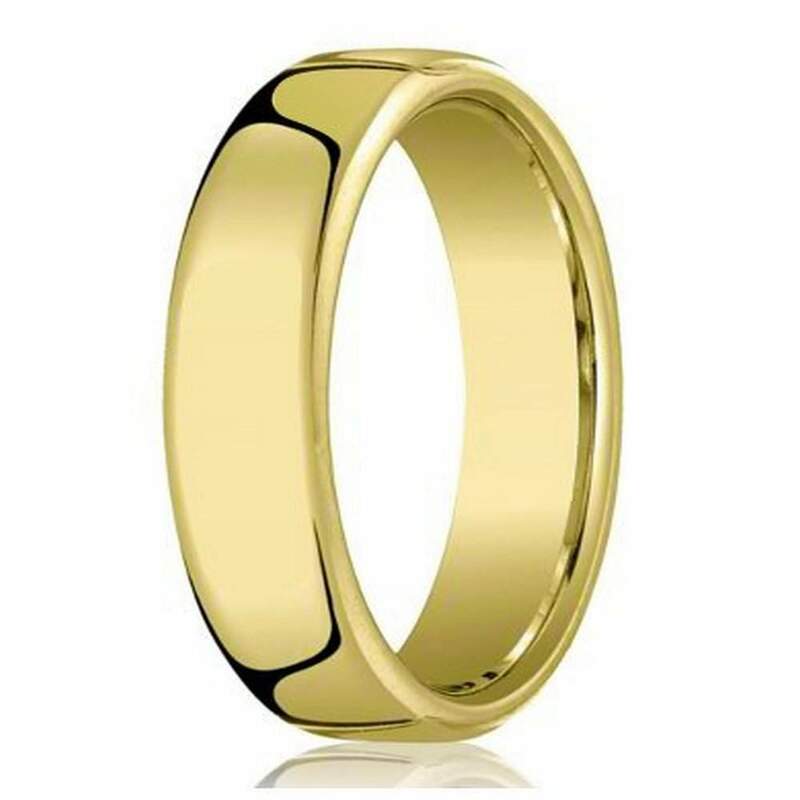 Every 6.5mm 10K yellow gold men's designer heavy comfort-fit ring conveniently comes in a gift box, so you can surprise your groom before the big day. Please contact us with any questions or concerns. Very nice ring. just as advertised. Quick delivery.